Item# 64001 Size: 16 fl. oz. Dermanyssus Gallinoe (Red Mites and Feather Louse) are well known and commonly found parasites that live in lofts, nesting boxes and on Canaries. 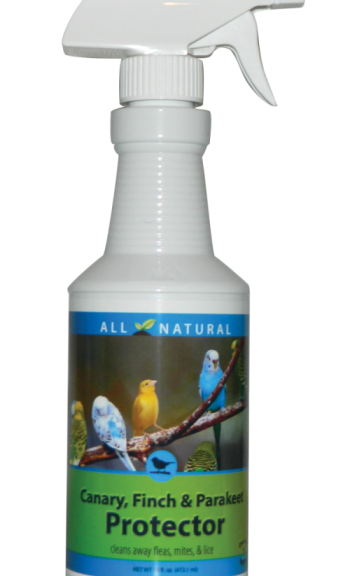 Canary Protector is a natural and organic product that cleans away parasites that live on the bird as well as in the cracks and crevices of a bird enclosure. Our product is effective in cleaning away the eggs, larvae, pupa and adult parasites, combating the issue at all stages of the parasite’s life-cycle. Remove bedding material, spray entire habitat with a fine mist, then wipe surface with a clean cloth. Rinse and let dry. Replace bedding material with new material and spray with fine mist for future protection against insects before reintroducing bird. Each week clean living quarters thoroughly with Canary Protector. CareFree Enzymes represents that this product qualified for exemption from registration under the 25(b)FIFRA.